So we were hanging out at home this afternoon at 4:00 p.m., when the inevitable happened, the boys were hungry and wanted a snack. Sometimes, I let them eat junk like chips, pretzels, cookies, etc. And sometimes, I give them healthy snacks, like carrot sticks, apple slices, apple sauce, or Mini Carrot Snack Muffins. These little muffins are so delish, you and your kids will love them. I ate mine smeared with Justin's Almond Maple Butter, yum! Preheat the oven to 350 degrees. Spray a mini muffin tin with non stick spray, and set aside. In a mixing bowl, whisk together the flour, sugar, salt, baking soda, and cinnamon. Add the carrot baby food, vegetable oil, egg, and grated carrot. Mix until combined. Scoop into the muffin tin, filling each 3/4 full. Place in the oven and bake for 15 minutes, or until done. 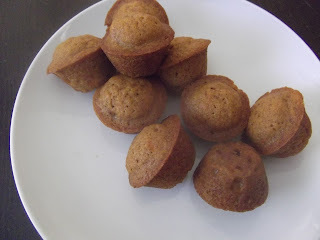 These muffins would be good if you doubled the recipe to serve at Break Fast. Tomorrow, I'm hoping to post some more good Break Fast recipes.